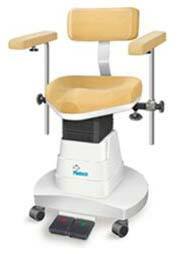 We are certified Manufacturer, Exporter & Supplier of Surgical Chair for numerous hospitals and clinics. Our Surgical Chair is made using stainless steel to ensure durability and higher shelf life to our equipment. Even after prolonged use, there is no distortion in color. In fact, the indigenous and easily serviceable chair remains stain free and scratch proof. We ensure timely delivery of our Surgical Chair all around the world. Perfect ergonomics for precision - driven microsurgery. Comfortable sitting angles, fit & flexibility. Noise - free, foot-switch controlled height adjustment. Strong back support with effortless spring-action & reclination lock. Backrest with easy-to-use height adjustment system. Flexible, yet sturdy arm support. Comfortable seat with polyurethane cushion.